Santa Claus and Mrs. Claus will return to the Nazareth Motherhouse Christmas Open House this year! Bring the kids by for snacks and crafts and a chat with St. Nick while you take in the beauty of the historic Nazareth Motherhouse. All ages are welcome from 1 to 3 p.m. on Sunday, Dec. 9, at the Nazareth Motherhouse, 1300 Washington, in Concordia. The Open House will include holiday music, coloring and fun for the kids and, of course, cookies, along with punch and coffee. Also included will be tours of the festively decorated five-story landmark home, which has been on the National Register of Historic Places since 1973. Many Sisters of St. Joseph of Concordia will be on hand to welcome guests, lead tours and serve refreshments. 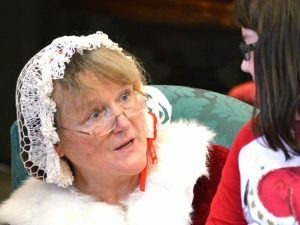 Last year’s hit Santa and Mrs. Claus — who on other days are known as Dell Lee and Annette Boswell of Leon, Iowa — will return again this year to delight their young guests. Be prepared for an entertaining time making Christmas memories and photographs that will last. 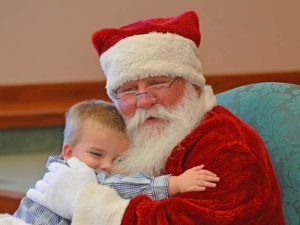 “I was so happy to see all the young families who came out,” said Ambria Gilliland, assistant development director for the Sisters following last year’s event. The easiest access is from the east parking lot (between the Motherhouse and the Community Garden). The event is free and open to the public.